I am so buggered. Just mentally and physically exhausted. Over the last few weeks I've finished four quilts to exhibition standard, the last one today. I delivered that one to the exhibition this afternoon and then I suddenly felt deflated. I didn't realise how much I had been running on adrenaline, but boy, I realise it now! So what's been going on? 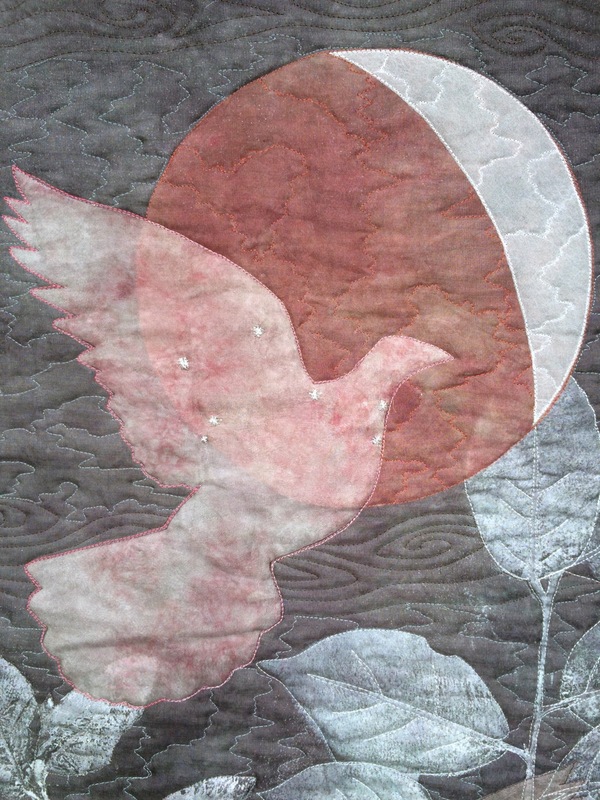 The NZ Quilt Symposium exhibition submission deadline was midnight Thursday (yesterday). And Wednesday afternoon I got a call from my good friend asking me if I had anything for the Matariki (Maori New Year) exhibition they were holding at the Waitangi Treaty Grounds where she works. A while ago I had agreed that I could probably have something for that exhibition and then promptly forgot all about it. So I asked Monika when she needed the quilts by, and bless her heart, she said, "Friday!" So not only was I hurriedly finishing, photographing and documenting symposium quilts, I also had to rustle up another quilt or two for the Matariki exhibition. I sat down and took stock. First up, did I have anything in my collection that would fit the bill? And actually I did. Matariki occurs when the Pleiades star cluster rises above the Eastern horizon. There are lots of stories associated with Matariki and it is a time of year for reflection and celebration. One of the Maori myths is about how the Matariki cluster was formed. When Ranginui (sky father) and Papatuanuku (earth mother) were torn asunder, Tawhirimatea (one of their sons, the god of winds) was so angry that he tore his eyes out and cast them into the sky where they formed the Matariki stars. Cool story, huh? 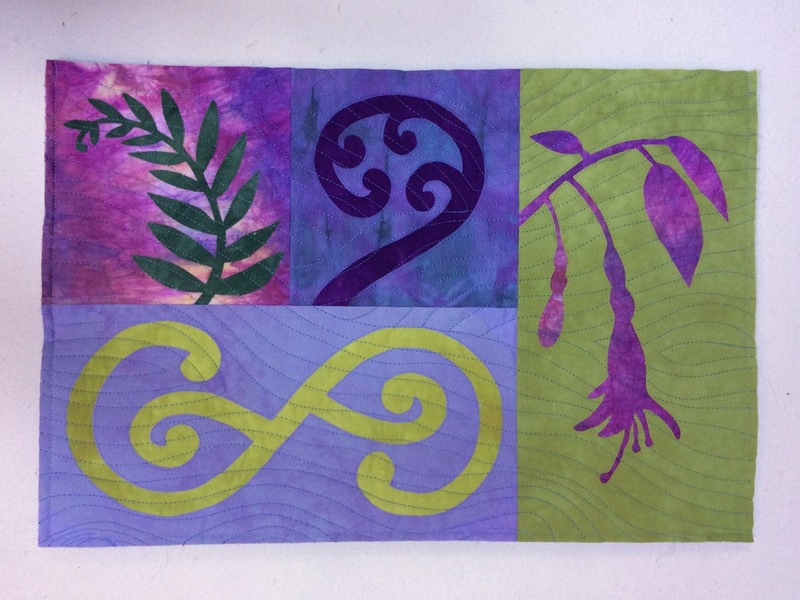 And I happen to have a quilt that has Ranginui and Papatuanuku featured as a subtle quilting design. It's called "I don't feel lonely". Phew, so that was one quilt, and it was completely finished with hanging sleeve and all. Then I looked over everything I was working on. 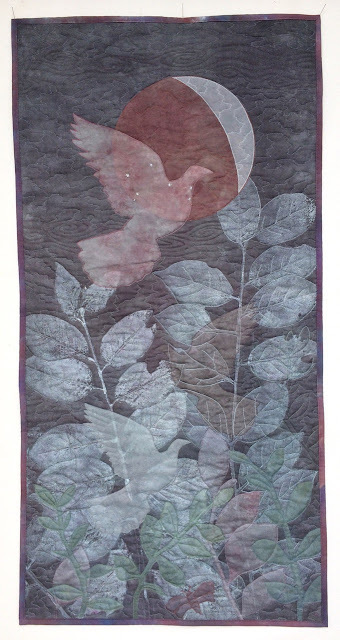 I had four quilts lined up for symposium exhibition, and one that I had decided not to finish for symposium. But now that I looked at it with Matariki eyes, I could see it would be perfect. Matariki is a time when people say goodbye to the loved ones passed away the previous year. It's a time of renewal, a time of remembrance and a celebration of the harvest along with holding portents for the coming growing season. Matariki reappears, Whanui starts it's flight. We say goodbye to those we lost in the year gone. We look towards the new season and send our hopes flying to the stars. 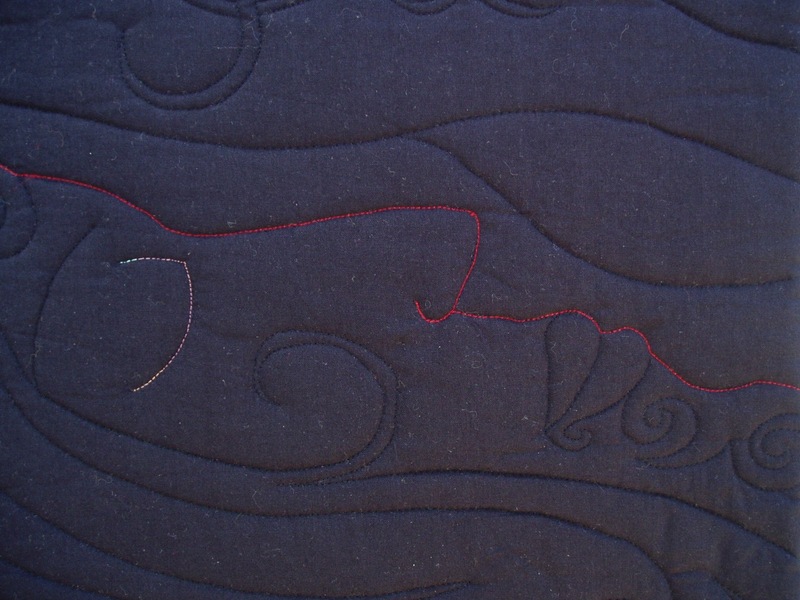 In the close up you can see the star cluster that I hand embroidered (with metallic thread - never again!). Maori often flew kites at Matariki, so the birds are a fitting symbol of that, along with being symbols of remembrance as well as hopes and dreams for the year to come. So everything got finished, photographed, documented, uploaded, delivered - whatever had to happen to each quilt happened and now I'm done. I'm sitting here, writing to you, drinking a comforting hot chocolate (it would have been wine, but I forgot to put some in the fridge) and thinking that I could easily not sew another stitch for at least a week. My brain hurts, my shoulders hurt, and my hand-sewing finger has holes in it. I was listening to a podcast by Tucker Harley the other day and he said something that resonates with me today. Creativity can be like breathing. Sometimes you are breathing out, creating, giving, making, sharing. And then sometimes you have to stop, and breath back it. That's what I feel like today. I've breathed every last drop of air out of my creativity lungs and now I need to pause, and take a big breath in. So I'm going to go relax and breath and when I next write I'm sure I'll be feeling more alive! 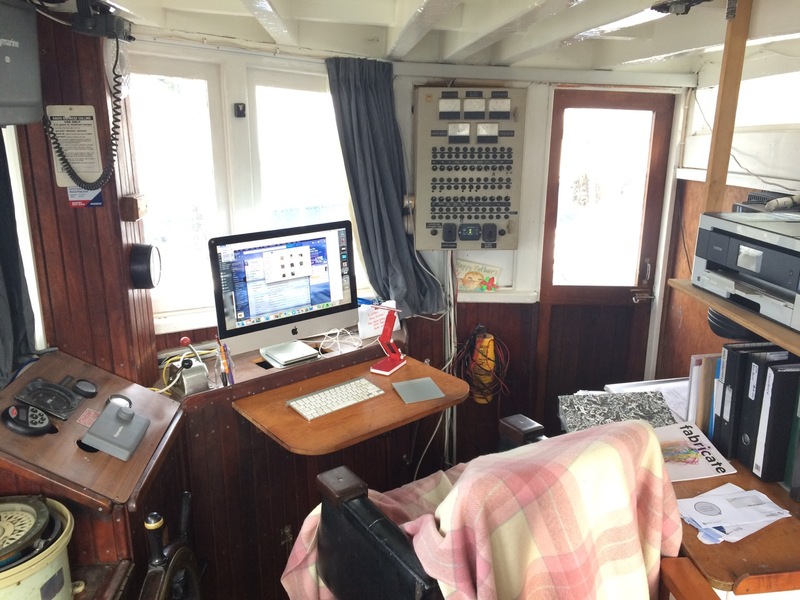 PS - I feel like I never share photos of my boat, so here's the wheelhouse/office where I'm sitting right now. It's full of boat thingies but my computer, printer and paperwork crams in too. 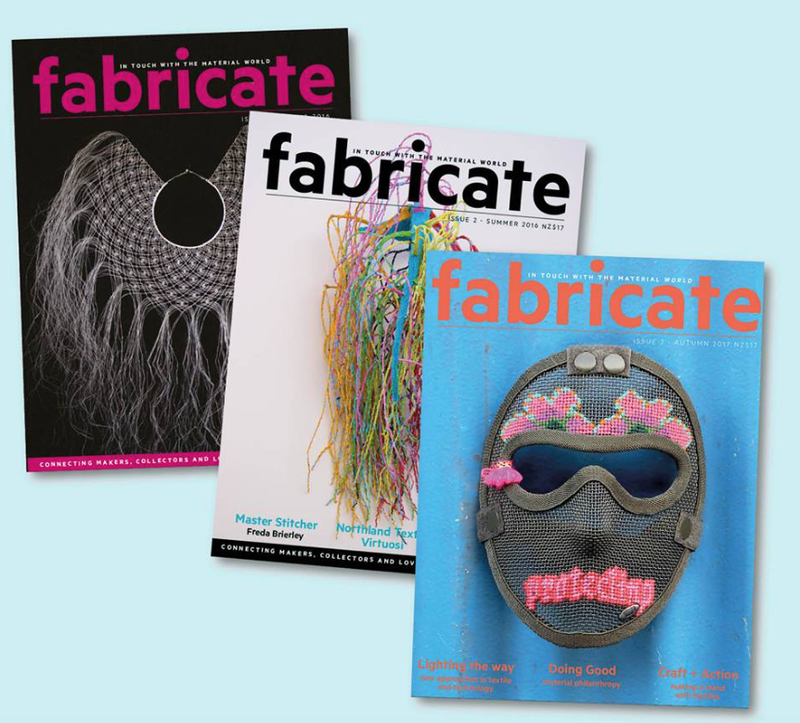 Cait gives us the story of Fabricate - from an idea that she ruminated on for quite a while to the beautiful magazine that has now had three issues published, with another heading to the printers any day. 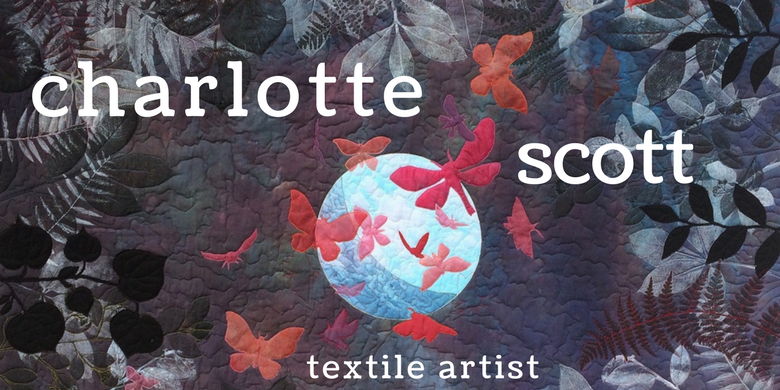 We discuss how textile arts fit into the world of fine arts, how much there is to discover about the textile arts scene in New Zealand and how Cait wants her magazine to 'join the dots' for people interested in fibre and textile arts across the whole scene. Cait gives us her thoughts on why she went with a print only (at this stage) magazine in what some may consider a brave move in the digital focused publishing world, and how she plans to be a sustainable business. We mention The New Zealand Fashion Museum and you can see the dress Cait 'lent' to them here. 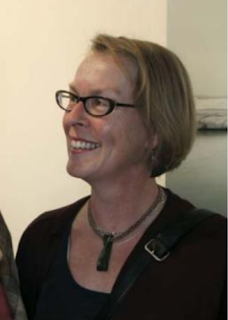 Cait also mentions an upcoming exhibition of Maureen Lander's work at the Dowse, find info here. Please take the time to listen to this chat, I found it a really interesting conversation and I think you will too. You can get podcast listening apps for both Android and Apple phones and tablets, and then in the apps you search for The New Zealand Quilt Show or The Slightly Mad Quilt Lady and hit subscribe. Once you've done that, every new episode will automatically turn up in your app without you having to search for it. If you'd like to subscribe to Fabricate and you haven't seen it in your local magazine stand, send Cait an email at the email address above. This episode was sponsored by Kerry Glen of Tulis Textiles. 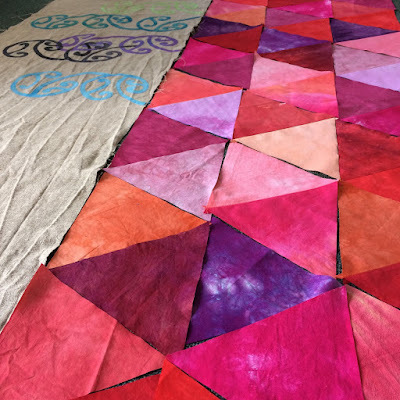 Visit tulis.co.nz for beautiful batik fabrics, rulers, tools, stencils, stamps and a wide range of fabric paints for surface design. If you're interested in sponsoring an episode of the podcast, please email me for details. 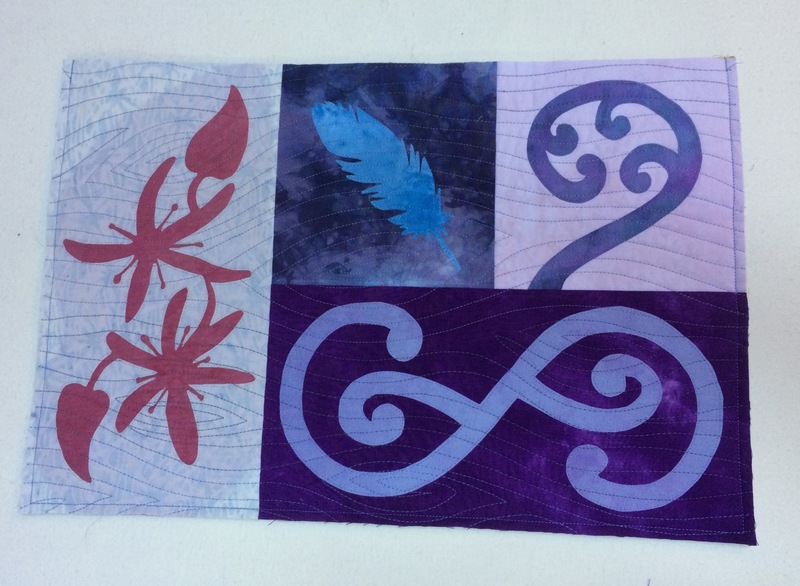 The NZ National Quilt Symposium exhibition deadline is looming. 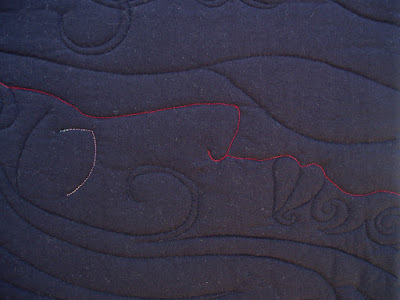 I'm sewing in threads and sewing down facings and hanging sleeves and I'm confident I'll finish up the quilts I'm working on in time. But that work is all hand sewing and I'm keeping it for evenings on the boat with my family, or for snatches of time in between dinner cooking and homework. So in the studio this past weekend (it was Queen's Birthday weekend here in NZ so we got Monday off too) I've been doing little catchup jobs. Bits and bobs. I put together two bassinet quilt tops and spray basted them. A friend is running a free-motion quilting class soon and instead of practice quilt sandwiches, she suggests we use bassinet quilts made from orphan blocks. 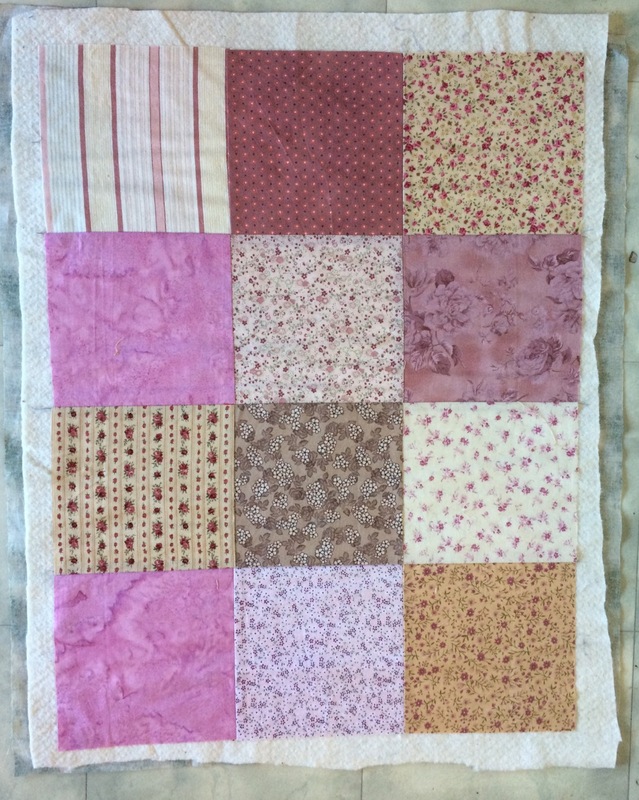 They are a good size to practice, the orphan blocks give the feeling of working on actual blocks, and they can be donated to the maternity unit after we are done to brighten up the postnatal ward. I really like the one above. Very modern. Made from half-rectangle units that I was practicing technique with (and I've put fun crocodile fabric on the back!). I have a bit of a pink overload in my stash and some of them are really old-fashioned. 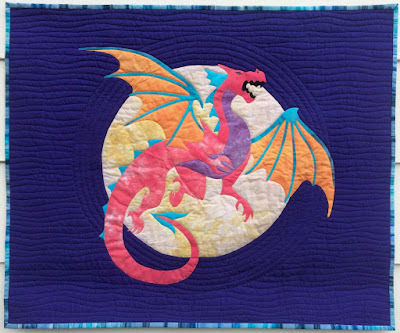 But they look sweet in a simple little quilt like this. Must make more and use them up! 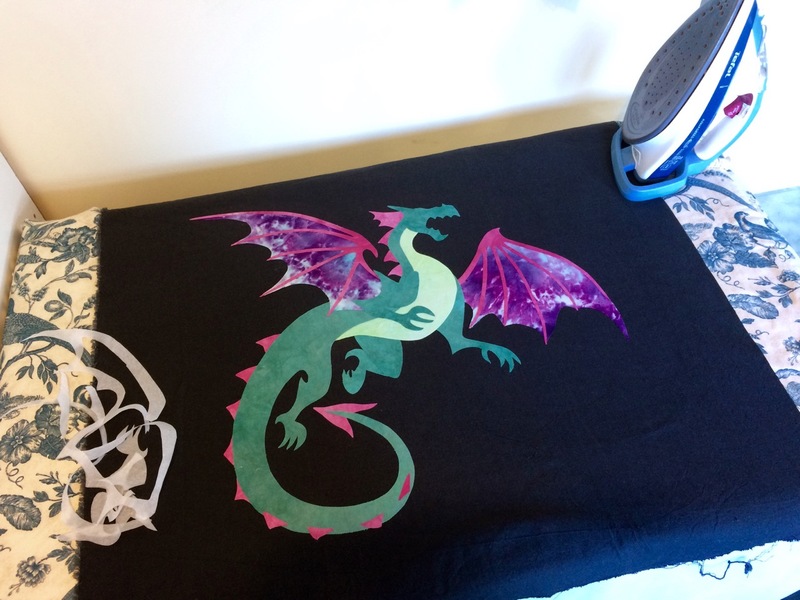 Then I used my new big pressing surface to fuse down this dragon that has been waiting in the wings. I sell the appliqué pattern for this panel on Etsy (both PDF downloads and paper copies), but I've been wanting to update my samples for a while. This is the second dragon I'm doing. Here's the first updated one I did. I can't remember whether I showed you or not, so I'll show it again just in case. She's made from my hand-dyed fabrics and I love how she glows! 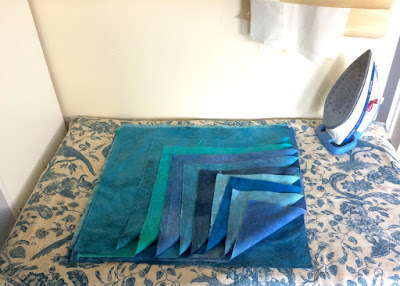 Then I found some positive/negative blocks that I had put together as samples for my Aotearoa Tote bag class but never finished into the final bag, so I finished up the free-motion quilting on them and I've sewed them together ready for straps and binding. 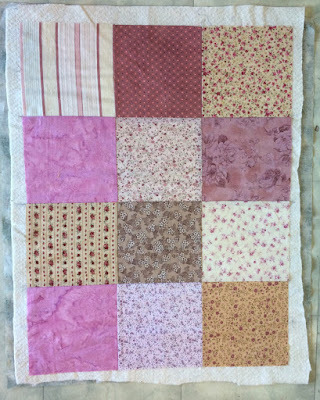 I chose a random wood grain pattern to quilt them with. 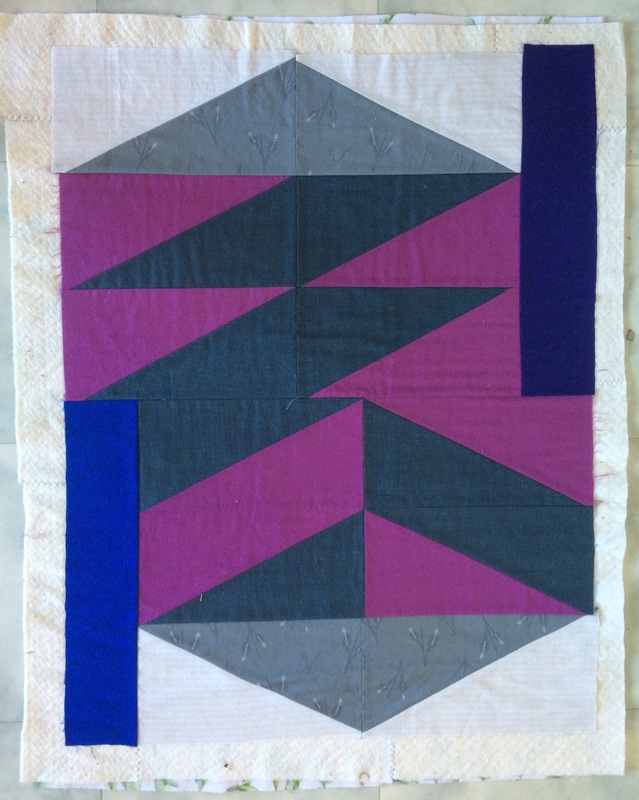 It's a very 'zen' pattern to quilt. And one you can do with your walking foot too. It's very satisfying to make progress on a whole pile of jobs. I'm not one of those quilters who work exclusively on one or two projects until they are completely finished, but lately, with the symposium deadline coming up fast, that's what I've been doing. It feels restricting in a way, so to rebel and take steps on a stack of different projects has soothed my spirit a bit. In fact, I've made such good progress on all my symposium entries that I've decided to make a stab at my unrealistic symposium project. Do you do that? A few weeks out, decide on a project that you know will be perfect and start work on it even though you also know it will be totally unrealistic to get it finished? Here's an Instagram pic of that project I posted a couple of days ago. It's a little further on than that now, but still in the piecing stage. Do you think I can do it?! The race is on! 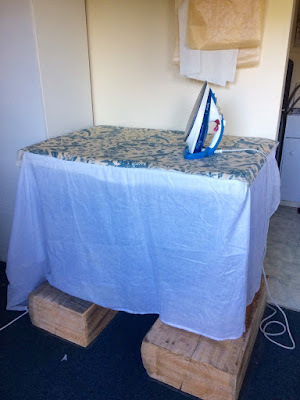 Following on from showing you my quilt cutting station, I'm going to show off my new pressing station. I had been using my ironing board in this location, but Suz's comment on my last studio tour post made me think. "I've still got my main cutting station set up on top of our large chest freezer... stole that idea off you before :o) but I changed the ironing board area, removing the legs and attaching the top onto a shelving unit. Makes it a bit taller, which is more comfortable to use, and I have useful storage space underneath!" So I assessed what furniture I had around, and here's what I came up with. A small fold up trestle table that we use for camping (not any more! ), those big chunks of wood designed for my door table (see the blog post on my cutting station), three layers of cotton batting, a white sheet, a piece of fabric for a cover and I'm good to go! 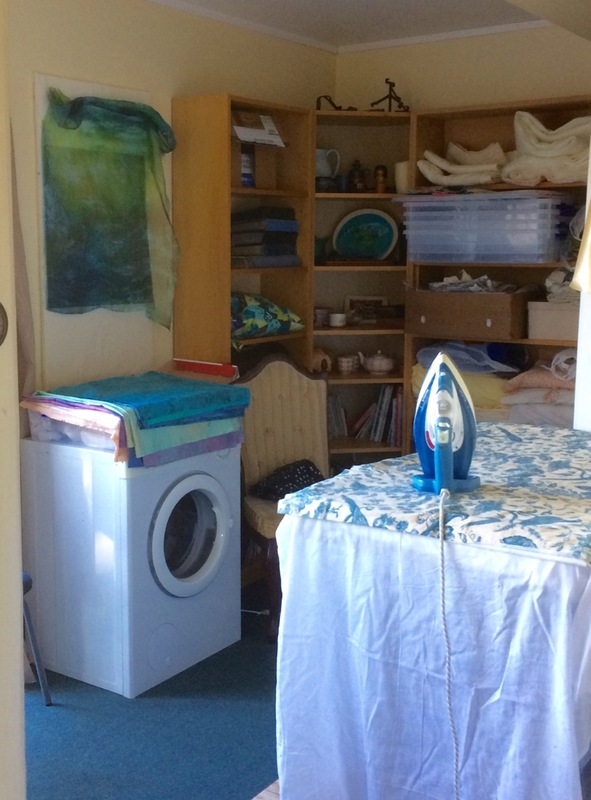 When I stand at the pressing station there is a large white cupboard to my left - that holds the majority of my fabric stash. To the right is a passageway to the laundry, bathroom and the only bedroom. The chunks of wood stick out a bit at the foot and I thought I might catch my feet, but I haven't yet so they are staying that way for now. They also sit on carpet and, from experience, the natural wood will leave marks. I don't know whether it's leaching or perhaps dampness from such a large chunk of wood, but either way, I've cut two pieces of plastic drop sheet the same size as the wood and placed them underneath to protect the carpet. 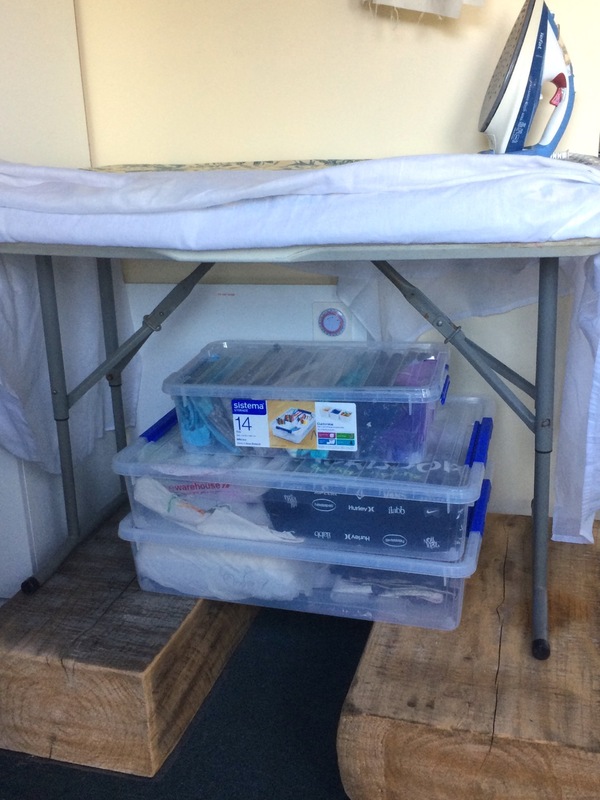 I hide the ugly trestle legs under a white sheet, and I've got storage of a sorts underneath. I can fit one more of the larger tubs under there too, and until now those tubs were just kicking around making a nuisance of themselves, so it's good to get them out of the way. You can get a sense of the size by knowing those are fat quarters of my hand-dyed fabrics. Loving the size!! All that room feels luxurious. There is an electrical plug just behind the table at floor height, so no problems with the iron cord. The trestle table top is made of heavy duty plastic, but I've stuck my hand underneath the three layers of batting after doing a session of pressing and it's warm but not hot, so I'm not worried about nasty, melty, plastic messes. And on the wall above the pressing station I have a contraption that my Grandfather made. He was an artist and iron worker in his spare time and I have a couple of chandeliers he made, a door knocker and this thing, which might be made to hang a light off? 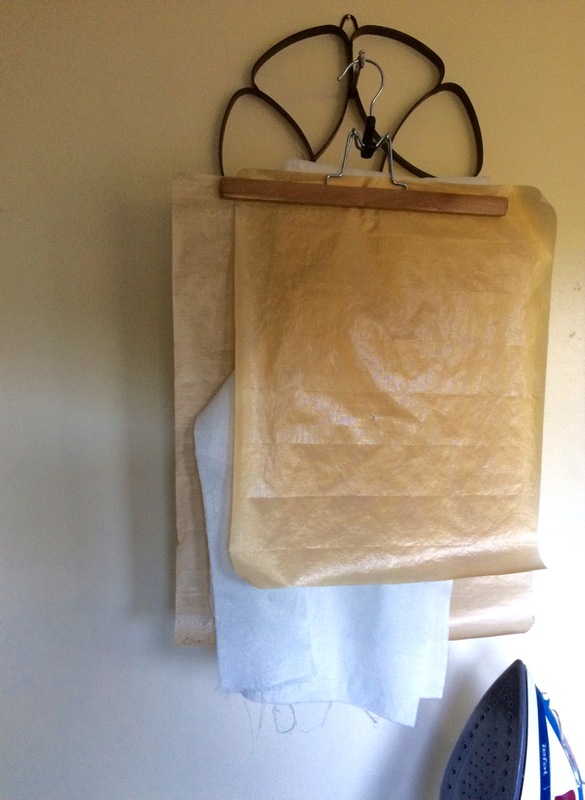 Anyway, it's now hanging my teflon and cotton pressing sheets. Very handy. Here's another view. I'm standing just at the entrance to the passage way to the laundry etc. To the left of the dryer is a door and then my cutting station is to the left of the door. The dryer is temporary (remember, the studio also serves as our storage unit). I do use it occasionally but have to pull it over so the vent sticks out the open door! That's a small design board above the dryer and then sets of storage shelves in the far corner and end of the room. I'm super happy with my new pressing station. Once again, nothing flash, but it gives me a chance to see if I really like the size and height and then maybe one day I'll invest in something a bit more classy! What do you use as a pressing station?